The Vionic Bella II Gold Cork is adorned with a cute little bow that is trimmed with the Vionic “V” logo. This sandal is the perfect sandal to slip on to take care of all your daily business. 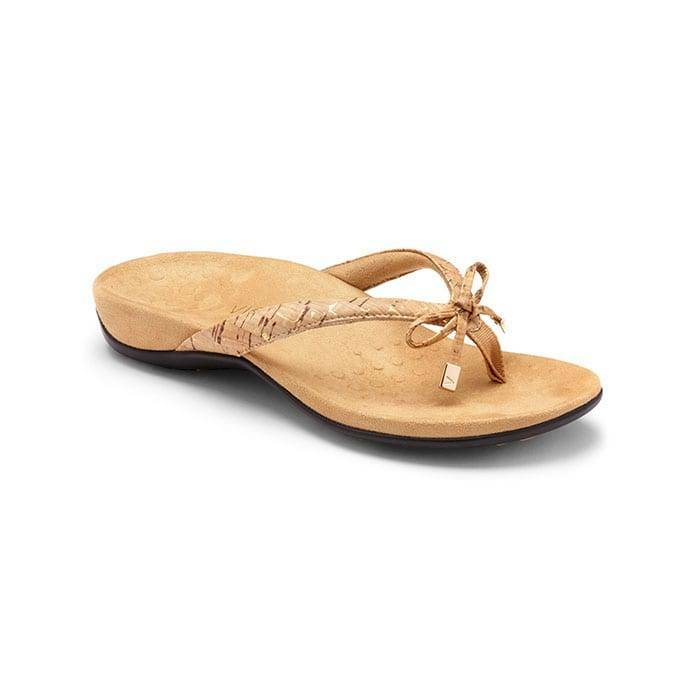 The Bella ll Gold Cork has a manmade upper and a microfiber covered footbed. Built with Orthoheel Technology that is designed to hug your arches and support your feet in comfort. The Vionic Bella II Gold Cork has a built in orthotic that is shown to be effective in helping to treat heel pain (plantar fasciitis). The Bella ll is finished off with a lightweight, flexible EVA midsole which absorbs shock, reducing stress on feet, ankles, and knees and a durable rubber outsole with a patterned tread which provides traction on a variety of surfaces. The Vionic Bella ll Gold Cork is recommended by renowned Dr. Andrew Weil and has received the APMA Seal of Acceptance.